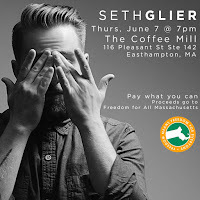 Singer- songwriter Seth Glier is performing at The Coffee Mill Easthampton at Eastworks (suite 142) on Thursday, June 7 at 7:00 PM. Admission is "pay what you can." All proceeds go to Freedom for All Massachusetts.